2 bedrooms, 2 bathrooms, living room, kitchen/dining, balcony. MW, DW, W/D, Cable TV, WiFi/DSL. POOL PRIVILEGES @ DAYS INN. BEDS: 1 King, 2 Single, sofa bed. Accommodates 6. NO PETS, NO SMOKING. 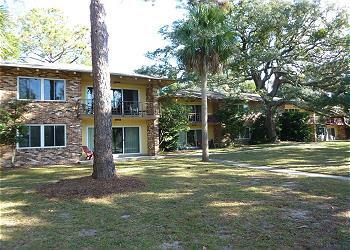 Stayed five weeks in this spacious unit, excellent access to beach and bike trails. We had everything we needed and Jekyll Realty is helpful and accommodating. Have a very time time . The location was was quiet and peaceful. Love Jekyll Island and this property has been wonderful for us in multiple stays. Items that needed repair were reported to Jekyll Realty: guest bath sink fixtures and lack of hot water access, backwards faucet in kitchen, dirty railing, patio door sticks, the dryer heat is not good every load took 2-3 tries. Otherwise, its a great unit and these are small annoyances but would enhance guest stays. Will be back next year if possible as we gave the last 15 years. WE really enjoyed our stay here. Very clean and location was perfect. Definitely stay here again. This winter has been the best experience at Jekyll. The warm weather the end of January through mid-March made it great for daily sunny visits to the beach. Jekyll island is offering a good variety of Island activities and restaurants. Jekyll Realty was friendly and always accommodating making the visit seamless! The beach and bike\walking trail. Great vacation! Atlantic Breeze, formerly Ocean Terrace, is a good apartment, but the location sets it apart. A clean rental, great size, good kitchen, just steps from the beach surrounded by great shade trees. This was our second time at Atlantic Breeze/Ocean Terrace and we will be back. Reservation staff were also incredibly helpful from working with us on an abbreviated rental for a holiday weekend to getting us checked in as early as possible. Staff were top notch and eager to help! Also, the upgraded locks to a keyless entry system was a fabulous move. Thanks for another great stay!